Decorative Life: Lasts 2-4 plus weeks or longer depending on environment. Borch, Brown and Lynch (1998) showed that lower levels of phosphorus fertilization (up to 30 times less than normal fertilization schedules) can improve postharvest performance as measured by less wilting. Namely, they are more tolerant to drought. Plugs can be stored for 6 weeks in the dark (6 weeks in light) at 45F and subsequently grown into very acceptable plants and/or flowers. Ethylene applications in the form of Florel sprays (biweekly applications at 400 ppm) can prevent flower formation on stock plants which in turn results in increased cutting number and subsequent rooting. Growing in mixes containing compost can produce plants with better postharvest performance. Chill sensitive, store above 55 degrees F. Plugs can be stored for up to six weeks at 50F if provided as little as 5 ft-c of light during storage. Storage temperatures for mature plants depend on the night growing temperature. For example, plants grown at 60F night temperatures stored better at 50-70F than those grown either at 50 or 70F night temperatures. 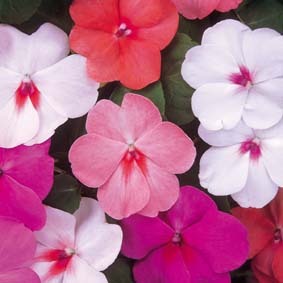 Impatiens: from Latin, referring to the sudden bursting of the ripe seed pods when touched. Hence, one common name is “touch-me-not”. The American Academy of Allergy, Asthma and Immunology list this species as an allergy-safe pollen producing plant. According to Jauron et al. (2000), fresh petals are edible. Can be used in salads, as garnish or floated on drinks. Some favorite cultivars and their respective flower colors include ‘Tioga’ (multiple colors including red, cherry red and purple), ‘Cameo Scarlet’ (red), ‘Cameo Light Pink’ and the Dazzler, Super Elfin and Accent series, each with a wide range of flower colors. Will generally do well in light levels at least bright enough to read a newspaper in comfort but more light (up to filtered full sunlight) would be better. Latimer (1991) showed that drought conditioning during production dereased lateral growth and plant/flower quality in the landscape. Snider et al. (2002) report that spraying ‘Super Elfin Rose’ and ‘Dazzler Salmon’ plants with 100 or 200 ppm of a natural lipid product (LPE) made them more resistant to water stress conditions. As of this writing, this product is not yet commercially available to the floral industry. If it becomes available, an announcement will be made in this website.